The Daimler Page this issue looks at the company’s long-established links with the Royal Family. The news that the last DS420s retailed are to go to the Royal Mews simply enforces the loyalty the monarchy has shown towards the marque for the best part of a century. King Edward VII was the first member of the Royal Family to show an inclination towards the motor car. While still the Prince of Wales, he went against the trend at the time by actually showing support for this new form of transport. Even before he came to the throne he had ordered three Daimler machines – the first one, a 6hp mail phaeton, being delivered on 28th March 1900. Cars progressed a great deal over the following few years and our first picture shows a new Daimler he ordered during the early part of 1904. Built on the 28/ 36hp chassis, the Hooper body was a replica of that found on the King’s 1903 22hp model. 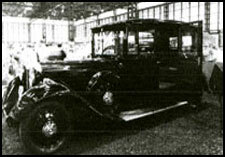 Post-WWI, King George and Queen Mary continued to show support for the Coventry firm’s products, with new cars being ordered every other year. They were usually Hooper-bodied limousines or broughams on the near-silent 9.4-litre sleeve-valve 57s, or the larger V12 chassis towards the end of the vintage period. 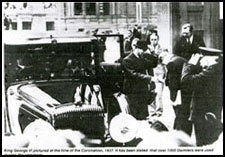 The death of King George V and the much-publicised abdication of King Edward VIII meant that the Coronation of King George VI was held during May 1937. With the Daimler Hire concern involved, it is said that over one thousand Daimlers were drafted into service, and indeed pictures showing massive lines of Daimler cars do little to disprove this rather bold statement. 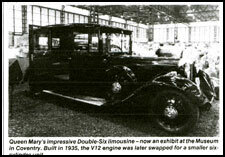 Four new 4.5-litre Straight-Eights were ordered during 1937, all of them bodied by Hooper, while a smaller ELS24 limousine was also built for Queen Mary. There followed a superb landaulette with a Perspex roof panel and, of course, the stunning DB18 drophead coupe. Built for the King’s personal use, it was originally finished in black and survives in excellent condition to this day. The last pre-war cars were rather unusual Daimlers in that they were badged as Lanchester models. This was the wish of King George VI and so two 4.5-litre Straight-Eight Daimlers – one a limousine, and the other a landaulette – were decorated with Lanchester grilles. Nearly 70 cars had been delivered to the Royal Family when war was once again declared on Germany. The idea of using Rolls-Royce motor cars had so far been dismissed by all of the reigning monarchs, and fluted grilles were the order of the day at all of the state occasions. The next time we look at Royal Daimlers we shall review the Royal Tours, try to find the reason why the marque fell from favour, and then move on to the Jaguar-built vehicles that once more carry the Royal stamp of approval.